This character asks for no explanation. It actually looks like a person who is laughing. The Laugh Pendant measures 2.8 cm (1 1/8 in) across. 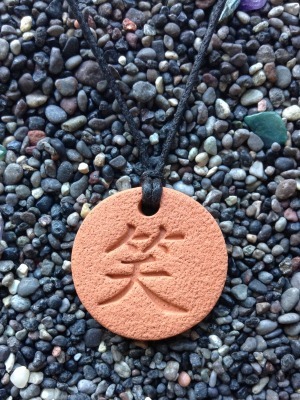 Terra Cotta Pendants come with black waxed cotton, sliding-knot cord which can be adjusted in length to approximately 38 cm (15 inches) to 76 cm (30 inches) long. Also included is a short black stretchy cord witch can be used to convert the pendant into a Car Diffuser or a Hanging Ornament by simply switching the cords. Items are neatly displayed inside a small (3 by 4 1/4 in) clear zip-lock bag along with a description card.